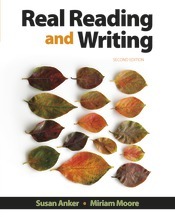 Real Reading and Writing, Second Edition, teaches the foundational reading and writing skills students need to enter freshman composition classes. Widely adopted at both two- and four-year schools, Real Reading and Writing employs the language of composition and addresses higher level topics, where appropriate, to help make the transition from supported to traditional coursework seamless for students. With a stronger emphasis on reading strategies throughout the text, the second edition does even more to show students how reading and writing are interconnected and integral to academic success.